I was in court to see what would happen today. The Attorney for Amber Buck filed something this morning and expected the judge to rule on it. Evidently Mr. Billington doesn’t understand how the court works. The judge gave the attorney for Michael Cardena until 9:00 am Monday morning to respond. Most filings give the opposition 30 days to respond, not Judge Hill. She was more worried about mom not seeing her son in person for over a year. Amber Buck went to Massachusetts in June and tried to get an emergency order for her to take her son. She failed, there is a whole story to that including fraudulent paperwork, but it didn’t come up today. Michael was willing to let her see Mikey, but after the fraudulent filings (he found out about by accident), his attorney said no. Another hearing will take place on July 25th at 1:30. While I was downtown I looked around a little. The parts I saw looked relatively nice considering it’s downtown Bloomington. 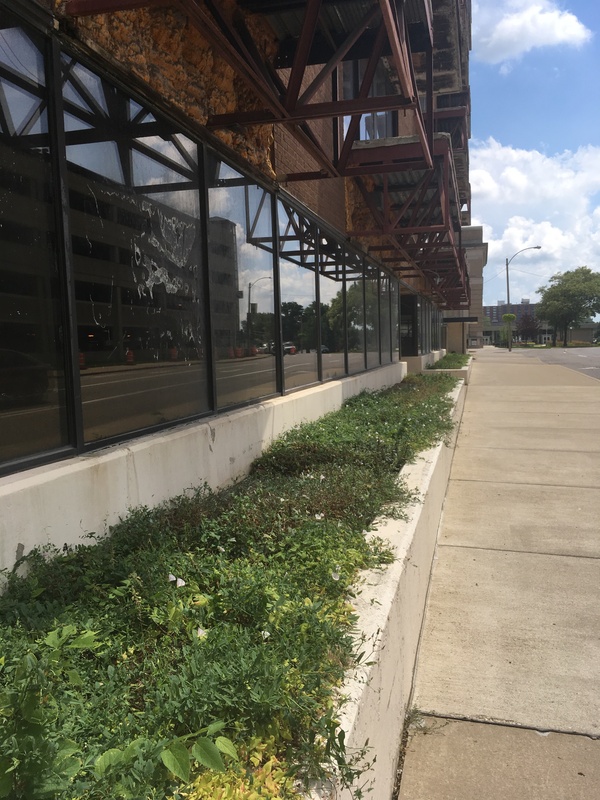 A lot of bushes have been removed around the Law and Justice Center, trimming them would have been better. Evidently who you know is important downtown. 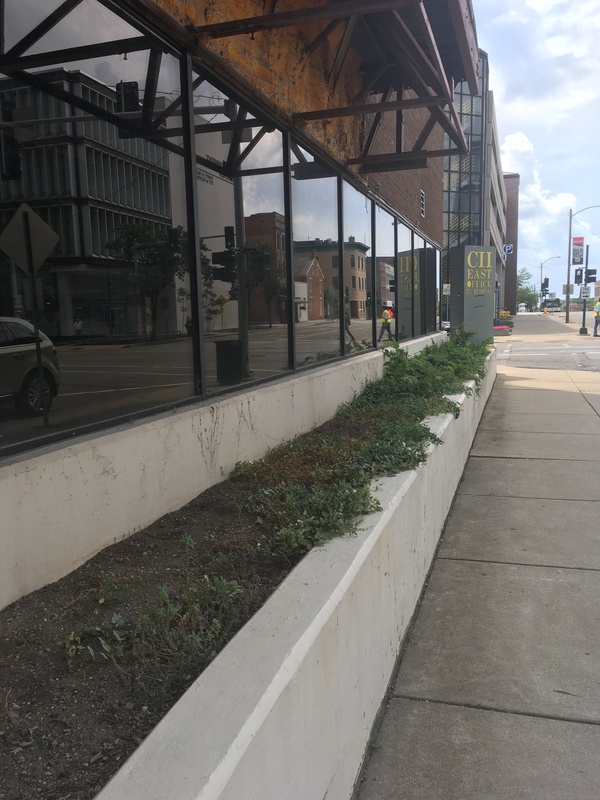 The CII East building has WEEDS growing in the planter boxes – yes those flowering plants are weeds. The planters are on booth the west and north sides of the building. The protrusions from the building look awful up close. This isn’t a code violation? I wonder if one of those arched wayfinding signs are slated for this corner? Posted in BloNo, Bloomington, BLOOMINGTON CITY COUNCIL, Liberal Media, Local, Pantagraph, Progressives, Renner.Tagged Amber Buck, direct criminal contempt., Michael Cardena, Mickey. I wonder who is paying her lawyer. I have been involved in a guardianship case and a quite nasty one I might say and I’ve had to shell out nearly $12K for lawyer fees and court cost. Having a lawyer isn’t cheap by any means. One has to wonder why the father left IL. I probably know why. I too considered taking the ward to another state. Sometimes doing the right thing you almost have to. The judges and laws are just crazy. They have no common sense in my opinion. Now I know why companies are fed up with our legal system. I PERSONALLY like the CRAP colored foam that’s exposed… Just kind of shows you the TRUE colors of the mayor and his cronies.. The vegetation is quite nice too.